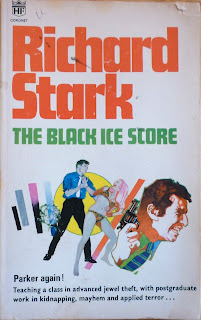 The first UK edition of the eleventh Parker novel, The Black Ice Score, published in paperback by Coronet in 1969 (originally published in the US by Fawcett/Gold Medal in 1968). 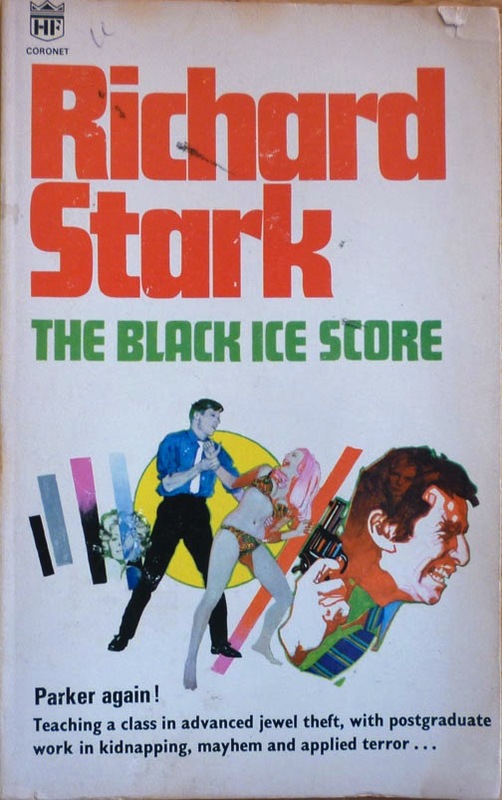 This particular edition of The Black Ice Score is so scarce I've never seen another copy of it anywhere online; I've only ever seen the occasional copy of the second and third printings (1972 and 1974), the ones with the Raymond Hawkey 'bullet hole' covers. Currently there are a couple of copies of that edition for sale on AbeBooks for around £25. But of this earlier edition I'd caught nary a glimpse. In fact, I wasn't even sure it existed: I have copies of two of the other Coronet paperbacks with this style of cover design, The Rare Coin Score (Coronet, 1968, Parker #9) and The Green Eagle Score (Coronet, 1968, Parker #10), and Trent at Violent World of Parker has a cover for the similarly styled 1969 Coronet edition of Parker #12, The Sour Lemon Score. But I hadn't seen a cover for this edition of The Black Ice Score anywhere. I still don't know who the cover artist was on these early Coronet editions – John M. Burns, perhaps? – but the indicia of The Black Ice Score does clear up a lingering question of chronology. 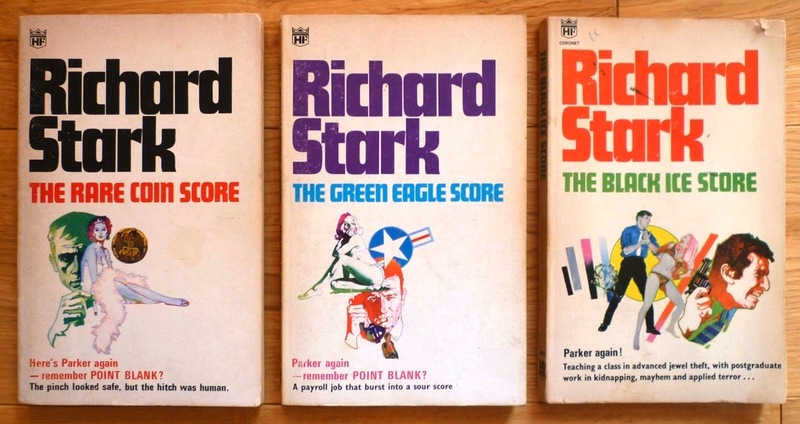 Under "Other Coronet Books by Richard Stark", the following books are listed: Point Blank! 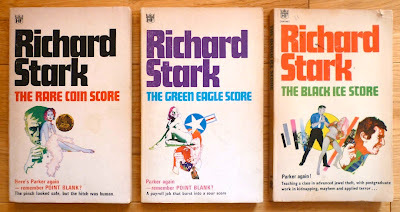 (Coronet, 1967), The Rare Coin Score (see above), The Green Eagle Score (see above)... and The Split (Parker #7). Now, in this post, I'd reasoned that Coronet hadn't published The Split – the first 1969 Coronet edition of which has a movie tie-in cover – until after The Sour Lemon Score. 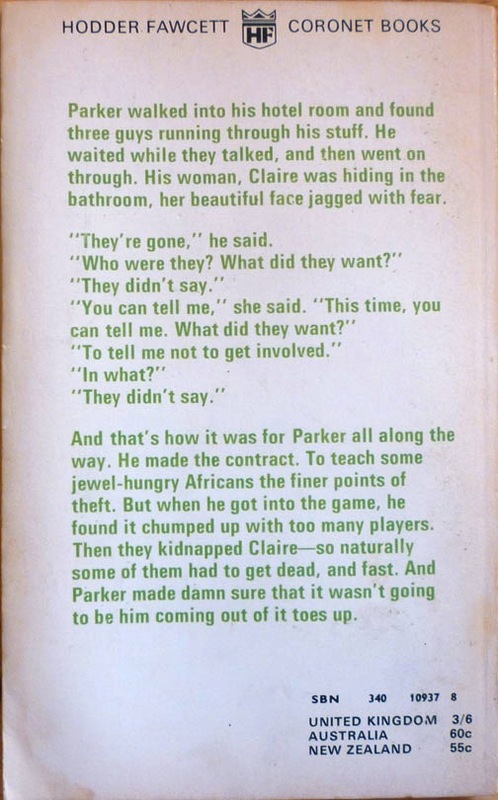 But it turns out the movie tie-in of The Split was published in the UK right in the middle of the run of four Parker novels with The Black Ice Score-syle illustrated covers. Which will be of no interest to anyone other than me, but what the hell: at least I know now.